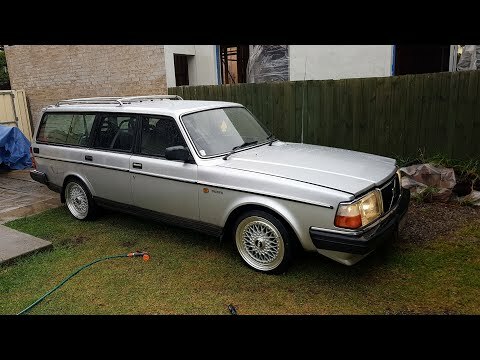 I've been using my Volvo a lot this past few weeks and it's developed a whining noise from the rear that's got louder and louder. What would be the best option for this do you think? P.S: There's also a clunking noise coming from the rear right wheel but no wheel movement to show it's a failed bearing. Not sure if it has anything to do with the whine but don't think it has. Rolling element bearings can degrade the races very quickly once a defect occurs and not necessarily show up as chunks of metal until they are seriously had it. Have you disconnected the tailshaft an taken the wheels off to check for a notchy movement in the pinion bearing or the wheel bearings? The other thing to check is to jack it up again and check that one wheel is rotating forwards and the other backwards when the tailshaft is turning (unless you have a LSD centre). Usually a diff wine or noise will be more pronounced under load and a wheel bearing noise will still be audibly when the transmission is in neutral and coasting. Sometime the wheel bearing will produce a rhythmic noise rumble noise and a diff pinion bearing failure more pronounced under load. I got stuck into the 240 today and pulled apart the rear wheel bearing, diff and pinion bearings. The issue was the pinion bearing but it was so hard pin point this. Although visually they don't look damaged. At one point I thought it was the carrier bearing. Now that the entire rear end has been pulled apart I'll grab all new bearings before putting it back together. So it turns out there is a bit of work in getting a new bearings and seals fitted. Getting all adjustments and back lashes set correctly is a bit of work. Has anybody a workshop/service manual or link to a place where I can view a workshop manual on rebuilding the rear diff? The Haynes manual i have doesn't give too much detail. The 140 manuals have a pretty good description. Setting the diff up once new pinion bearings have been fitted is a pretty big job. He is the reason my car still runs to this day!! The CONSTANT "Whine" from the back, is the mother in law. It wont stop till you kick her out!